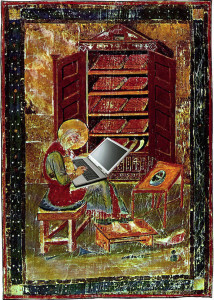 Digital Editing of Medieval Manuscripts (DEMM) is a joint training programme between Charles University in Prague, Queen Mary University of London, the Ecole des Hautes Etudes en Sciences Sociales, the University of Siena, and the library of the Klosterneuburg Monastery. It equips advanced MA and PhD students in medieval studies with the necessary skills to e dit medieval texts and work in a digital environment. This is done through a year-long programme on editing medieval manuscripts and their online publication: a rigorous introduction to medieval manuscripts and their analysis is accompanied by formal training in ICT and project management. The end of each one-year programme will see the students initiated into practical work-experience alongside developers, as they will work on their own digital editions, leading to its online publication. Funded by the Strategic Partnership strand of the European Union’s Erasmus+ Programme, DEMM will run for three consecutive years, always with a new group of students. It will lead to the publication, in print and online, of teaching materials, as well as a sandbox of editions. You can find information on Partner Institutions, Current Students, Programme of Activities and Application Details on this website.